Don’t be scared away by the long list of ingredients in this dish. It’s mostly spices and seasonings and isn’t a sign that this is complicated dish. In fact, it’s pretty easy to throw together, especially in the slow cooker. I honestly wasn’t sure how my family would like this, but everyone loved it, much to my surprise and delight. It is a very saucy recipe, which I like, but if lots of sauce isn’t your thing, try using more chicken (if you’re feeding a crowd) or making half the recipe with the same amount of chicken. 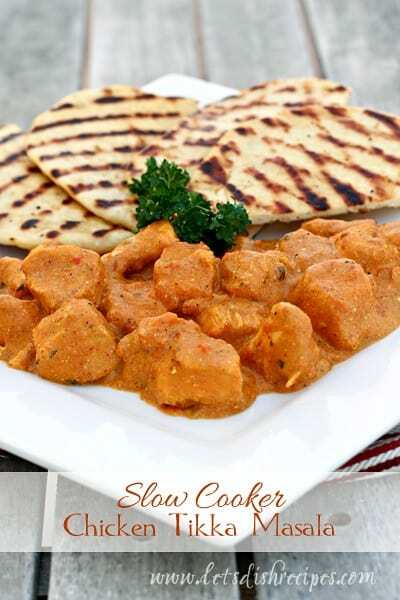 We like to serve this with homemade Naan Bread if I have the time to make it, but it’s delicious over rice as well. Melt butter in large sauté pan over medium-high heat. Add chopped onion, garlic and ginger and cook until vegetables are just tender, about 5 minutes. Stir in Garam masala, cumin, paprika, coriander, turmeric, cinnamon, salt, pepper and cayenne. Add the onion and spice mixture to the slow cooker, along with the cubed chicken. In a medium bowl, stir together the crushed tomatoes, yogurt and lemon juice. Pour over chicken in slow cooker. Cover and cook on low for 6-8 hours (or about 4 hours on high). About 30 minutes before eating, whisk together the cream and cornstarch in a small bowl. Pour into the slow cooker and stir. Cook for an additional 20-30 minutes. Garnish with chopped cilantro, if desired, and serve over rice or with Naan Bread. So I was about to click away… until your comment convinced me not to be as terrified by the length of the ingredient list. Just need to pick up one missing spice and we’re good to go! Chicken Tikka Masala is a favorite dish at our house. I’m excited to now have a crock pot version. This looks delicious–and, I can never have too much sauce. This is making me want to lick my computer screen. This just looks SO good. I haven’t used my slow cooker as much as I would like to lately -thanks for the inspiration! Absolutely delish and easy. Made it last night with my young child who loved to help measure the ingredienrs and stir the tomatoes/yogurt/lemon juice — then we let it cook overnight. In the fridge for the day and reheated in the crock tonight and added in the cream/starch and presto yum! Served it over rice with a side of madras lentils and steamed snap peas. Thanks so much for this recipe, bound to become a favorite! Do you think I could replace the heavy cream with coconut milk? I am. What have you got to lose!